When we looked for the video on the internet, we came across a video posted on Youtube by the Gujarati News Channel in May, 2017. The show anchor mentions that the video has gone viral and is from BMS bridge in Pipavav, Amreli. The anchor also said that the Forest Department is unaware of it and that such situations keep happening in Amreli. We also found a news report by ABP Asmita saying the same. This is not the first time that such an incident has taken place. Reports show that Gir region is inhabited by a large number of lions. In August last year as well a pride of lions had entered residential area of a village in Amreli. BOOM got in touch with GIR National Park to know more about the video and we will update the story once we get a reply from them. 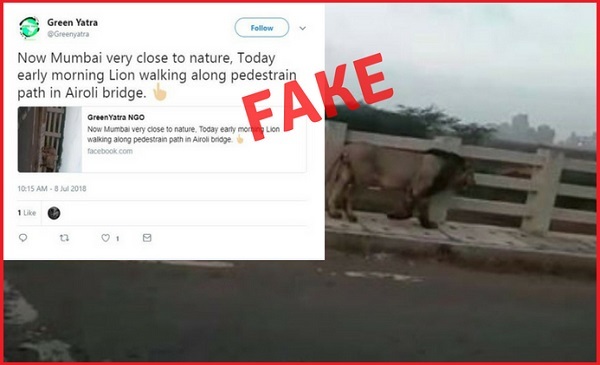 Moreover, the Airoli bridge that connects Navi Mumbai to Mumbai and Thane has no forest cover in its immediate vicinity which makes it difficult to find a lion there. The Sanjay Gandhi National Park situated between Mumbai and Thane has almost 25 lions and lionesses and there are no reports of a lion missing from the National Park.